Cincinnati city officials and community leaders are expected to gather at Fountain Square Tuesday morning to unveil the first of Cincy Bike Share’s 35 stations. The ceremony will mark the official start to construction of Ohio’s second and largest bike share system. Queen City Bike says that the process will move quickly, with two to three stations being installed daily until all 35 stations planned for Downtown and Uptown are built. At the same time, there will be a volunteer effort to assemble the system’s 300 bikes. The aggressive schedule puts the system on track to open by early September, which is not far off the initial goal of opening by August. The progress comes after Cincinnati Mayor John Cranley (D) announced $1.1 million to more than half of the initial $2 million in upfront capital costs. At the time, Cincy Bike Share director, Jason Barron, said the commitment from the City of Cincinnati was critical in not only getting things moving, but also showing the private sector that it is all for real. Bike share systems have been growing in popularity in North America over recent years. While the most notable are Washington D.C.’s Capital Bikeshare, Chicago’s Divvy and New York City’s Citi Bike, there are now dozens of other cities operating similar systems. The large number and established time period of operations now has given planners a chance to examine empirical data to see what works best. The more complexities you add to a mode of transportation’s functionality, the less likely someone is to choose that given mode for their trip. This is something that is true across all modes of transportation. As a result, the station density and space contingency calculations have proven to be consistent indicators for a bike share system’s success or failure. Studies have found that a higher station density is better, and that a target should be approximately 28 stations per square mile. For a city like Cincinnati, that averages out to be a station every couple of blocks. However, the number and placement of Cincy Bike Share stations will be much lower than this target. When examining of each of the 35 station locations, the system’s station density can be calculated in two different ways. The first would look at just the immediate area in which the stations are located. The second would look at the intended service area for those stations. Naturally, the latter is a bit more subjective. In the case of the first scenario, the Downtown/OTR portion of the system would have approximately 15 stations per square mile, while the Uptown portion would have 10. Overall, the system in its entirety would average out to a respectable 13 stations per square mile. But under the more second scenario that factors for intended service area these numbers drop. In this case, Downtown/OTR would fall to 12 stations per square mile, and Uptown would plummet approximately four stations per square mile. Overall, the system total would average out to be nearly stations per square mile. It is important to note that neither of these scenarios includes the Union Terminal station in its calculation since it is an outlier and would clearly skew the results. Furthermore, Downtown/OTR and Uptown were separated in their calculations since many planners and observers concede that the two areas will most likely operate in isolation of one another. The point is to ensure that there are consistently stations within a short distance of one another so that if one station is full or empty, another station is close by for the potential user. If that user encounters such a situation, however, it is most likely that the potential user will avoid using bike share altogether and instead opt for a different mode. One of the ways this can be combatted is through the use of real-time tracking technology that allows users to see exactly how many bikes or stalls are available at any station at any given time. This, of course, only aids those with access to data plans on compatible smart phones, and those who think to use it. In order to fix the problem of full or empty stations, system operators perform ‘bike balancing’ which moves excess bikes from one station to another that is low on bikes. This balancing act proves to be one of the most costly elements of operating a bike share system. In Chicago and bigger cities they utilize small vans to move the bikes around. But in Salt Lake City, where their GREENBike system is quite small, they utilize trailers hitched to the back of other bikes. As a result of this complex balancing act, and potential barrier to users, another key element of bike share systems is a space contingency at each station. What this means is that if a station has a capacity for 10 bikes, it should not be stocked with 10 bikes. Instead, data suggests that about a 50% space contingency is ideal. 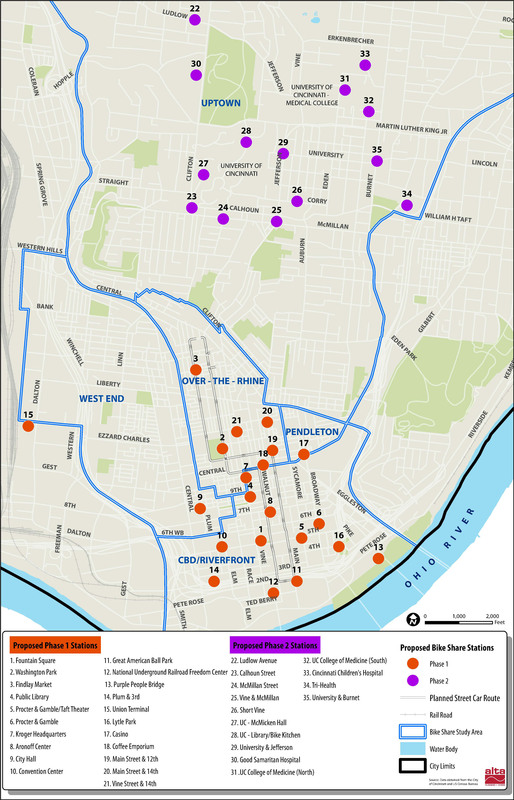 In Cincinnati’s case, Cincy Bike Share will have enough bikes for there to be roughly nine docked at each of the system’s 35 stations. If the system were to fall in line with this 50% space contingency, which would mean that an additional four to five stalls should be available at any given time, meaning each station should have a total of 13-14 stalls. This, however, is not the case. Cincinnati’s typical station will have 10 stalls, and thus only have a 10% space contingency. 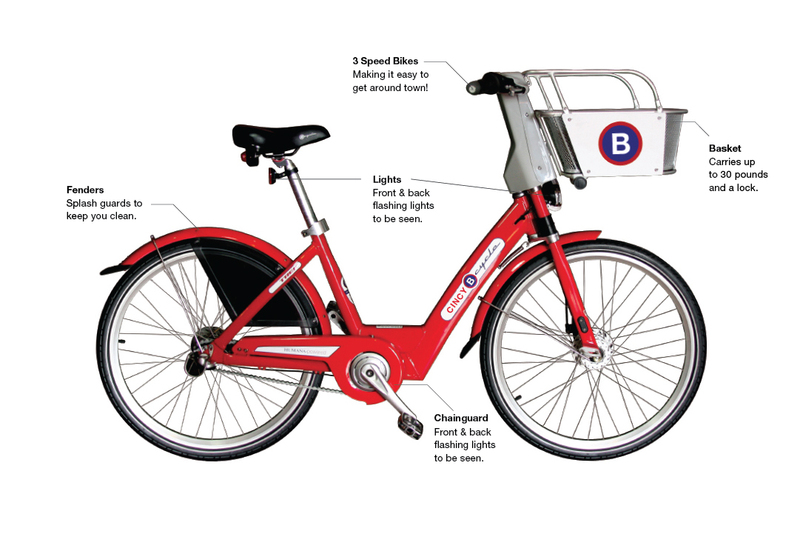 Cincy Bike Share officials have not yet commented as to how this will be mitigated, but a potential solution would be simply to not deploy all 300 bikes at once – something that seems reasonable since bikes will need to rotate in and out for repairs. In this case, a more appropriate number of bikes to be in use at any given time might be 240. Cincinnati’s bikes are expected to be available for use 24 hours a day, and will most likely be available for use year-round. Cincy Bike Share will be responsible for setting the rate structure, which is not final yet, but annual memberships are pegged at $75 to $85 and daily passes between $6 to $8. Uptown was originally envisioned as a second phase to the system; but now that it is being included in the initial rollout, it leaves an expansion to Northern Kentucky as the next logical choice. More details are expected to be announced at the press event later in the week. Next articleJust how valuable are America’s iconic urban parks?